We love pancakes in my house. Pancakes made with granola, chocolate chips or blueberries. Any which way you flip them, we are a fan. But if you’re cooking for a crowd you need an easier solution than standing at the stove constantly flipping. That’s where my pancake bake comes into play. Make the mix as you normally would and get creative with the filling. 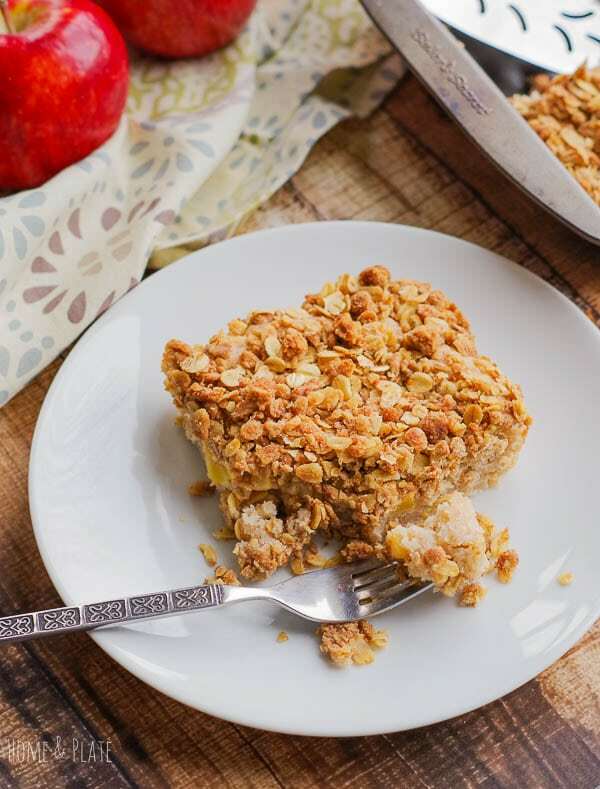 For this breakfast casserole, I added puréed apple pie filling to the mix, tossed chunks of sweet juicy apples on top and sprinkled plenty of cinnamon oat streusel topping to finish things off. This recipe makes one casserole. Double the recipe and no apple pie filling will go to waste and you will have enough to feed a crowd. And it’s a good thing, because it will disappear quickly. If you make one you’ll wish you had made two. 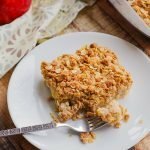 I’m not sure which is the best part – the fluffy bite of pancakes, the taste of apple pie or the crunchy sweet crisp topping. My son would say it’s the crisp topping. I’m just glad the dish is filling enough to hold him over until lunchtime. It’s easy enough to give this pancake bake a protein boost. Just add a little protein powder to the mix or buy pancake mix with protein already added. I’m a big fan of unsweetened protein powder. You can add a scoop to just about anything without compromising the flavor of whatever it is you’re making. Scroll down for the brand I recommend. This is the perfect recipe for a weekend or holiday breakfast and leftovers heat up quickly in the microwave. 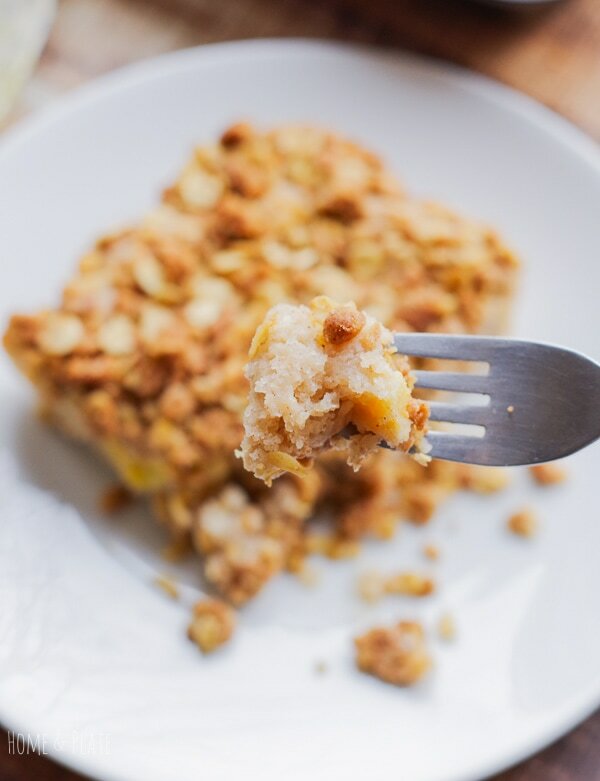 Want to learn how to make this Apple Pie Pancake Casserole? Pin them to your Breakfast board to save for later! Preheat the oven to 350°F. In a large bowl mix together the pancake mix, cinnamon and water. Purée the apple pie filling and stir into the pancake mixture. Reserve the remaining apple pie filling for another time or double the recipe. For the topping, combine the brown sugar, flour, 1 teaspoon of cinnamon, oats and melted butter in a small bowl and mix until crumbly and well blended.5. 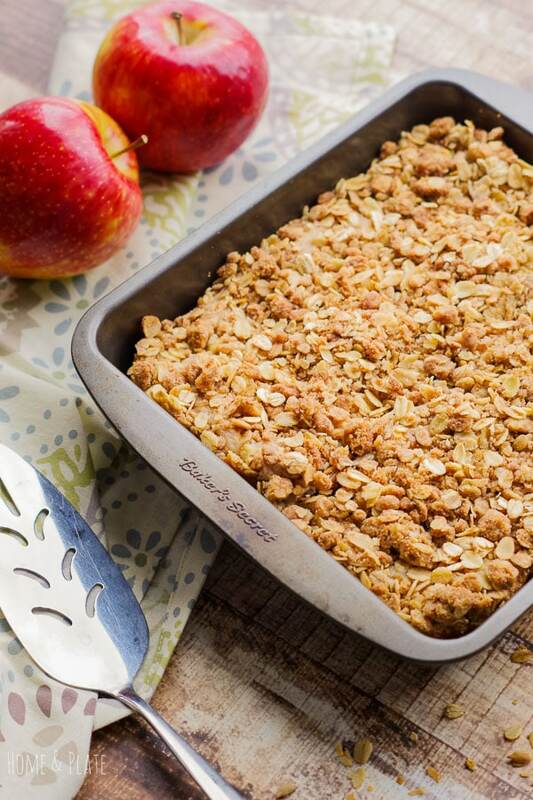 Pour the pancake mix evenly into the baking dish, top with the diced apple and sprinkle the crisp topping over the apples. Bake for 40 minutes or until the pancake batter has become firm and golden on top. A knife inserted into the center should come out clean. Serve warm. Easy, crunchy breakfast. I need to try this with my morning coffee! Wow! This breakfast pancake is over-the-top! This would be great for when the whole family is together! Ooh, this would be a huge hit with my family. I love that crisp topping! Definitely a fun breakfast for a crowd. I love this idea and must give it a try for family this weekend. 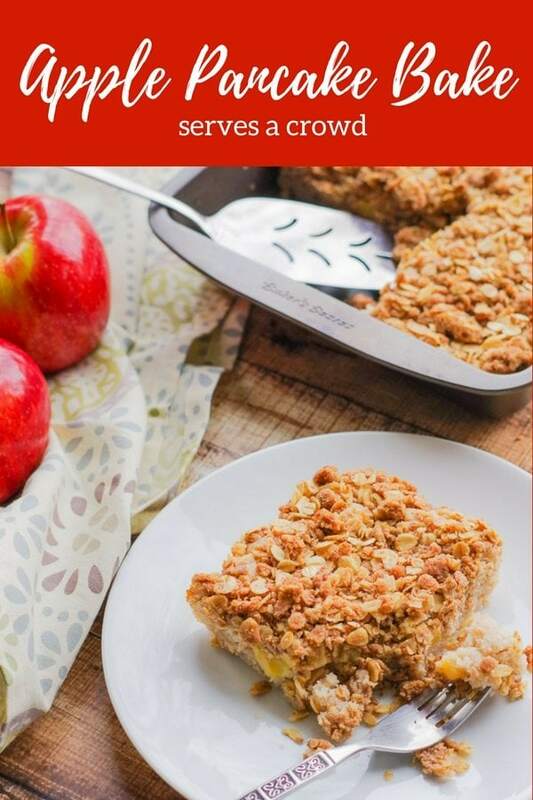 I love apple pie and I love pancakes – bringing the two together in this easy and delicious cobbler is genius! Thanks Shashi… so easy and the best way to enjoy a weekend morning.